This year’s theme is EDGE: Explore, Discover, Grow, Engage. The planning committee includes representation from the community and campus, and we look forward to presenting to you the great ideas worth spreading that have been selected for the event. TEDxUW-Stout will be held on Friday, October 23, 2015 in the Memorial Student Center at the University of Wisconsin-Stout. 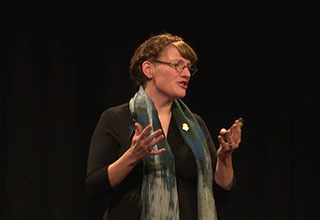 This website includes information for persons seeking information about the event presenters, how to obtain tickets, and how to sponsor TEDxUW-Stout. Contact information is also included should you have questions not addressed here. Thanks for your interest in this event. We hope to meet you on October 23! TED's media initiatives include TED.com, where new TED Talks are posted daily; the Open Translation Project, which provides subtitles and interactive transcripts as well as translations from volunteers worldwide; the educational initiative TED-Ed. TED has established the annual TED Prize, where exceptional individuals with a wish to change the world get help translating their wishes into action; TEDx, which supports individuals or groups in hosting local, self- organized TED-style events around the world, and the TED Fellows program, helping world-changing innovators from around the globe to amplify the impact of their remarkable projects and activities. UW-Stout offers a stimulating mix of academics and activities within the campus and the larger community. As Wisconsin’s Polytechnic University, UW-Stout is poised as a perfect host for a TEDx event. The Select Mission of the institution is: The University of Wisconsin-Stout is a career-focused, comprehensive polytechnic university where diverse students, faculty and staff integrate applied learning, scientific theory, humanistic understanding, creativity and research to solve real-world problems, grow the economy and serve a global society. UW-Stout currently has 9,300+ students who choose from 44 undergraduate and 20 graduate majors, ranging from supply chain management, education or vocational rehabilitation, to art and design, applied social sciences or engineering technology. The innovative and hands on learning extends beyond the classroom for students into their co-curricular involvement. With more than 150 student organizations, volunteer opportunities, leadership development, intramural sports, arts, and theater programs, the opportunities are endless. At the end of their time on campus UW-Stout graduates have had more than a 95% employment rate in the major - for the past 30 years. In and outside of the classroom UW-Stout is a great example of living the EDGE: Explore, Discover, Grow and Engage theme. We encourage you to explore, participate and take advantage of TEDx and more here at UW-Stout. Dan is a middle school technology education teacher in Chippewa Falls, Wisc., entering his tenth year in the classroom. Dan specializes in teaching computer hardware and software, but will also occasionally teach welding. An alumus of UW-Stout, Dan recently earned his master’s degree in education from Viterbo University. Dan is currently working with teachers across disciplines and teaching levels to increase student engagement with gameful design principles. As a farm kid with a practical sensibility, Amy landed in the world of university housing and student affairs some 20 years ago. Amy currently works as an Assistant Director of University Housing at UW-Stout. She gets to problem-solve daily, working with students adjusting to college life. A few strategies, with a little nudge--even a push sometimes, keeps us all learning life’s lessons as inexperienced and isolated humans trying to make sense of the crazy. 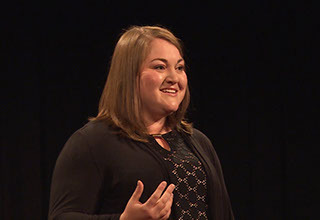 Greta Munns graduated from University of Wisconsin-Stout in 2011 and returned to serve as Wisconsin's first Foster Youth Liaison with Fostering Success at UW-Stout, using her personal foster care history and youth development background to connect and empower a range of at-risk youth. Holding internships with social-justice and child welfare organizations such as Fosterclub and The National Resource Center for Youth Development, she has testified before U.S. Congress and presented workshops around the nation focusing on meaningful youth engagement and youth-adult partnerships. 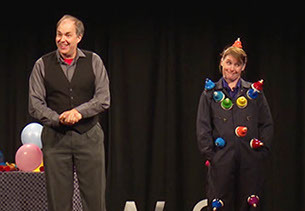 As the professional comedy juggling duo, In Capable Hands, Steve Russell and Kobi Shaw have shared their whimsical talents on on several national TV shows including The Tonight Show, Live with Regis and Kelly, The Ellen Show, and in many major entertainment venues including Ringling, Disney, Lincoln Center, and Carolines on Broadway. Learn more at www.InCapableHands.com. 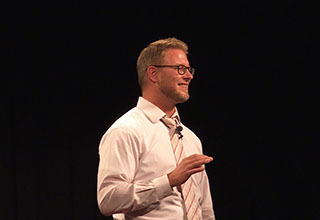 Nels Paulson is an associate professor of sociology at University of Wisconsin-Stout. He researches issues surrounding the environment and civil society, and has been published in a wide variety of journal publications. Paulson also directs the National Science Foundation sponsored LAKES REU project, which attempts to find ways to clean polluted waters while simultaneously making communities more integrated and sustainable. Learn more about LAKES REU at www.uwstout.edu/LAKES. 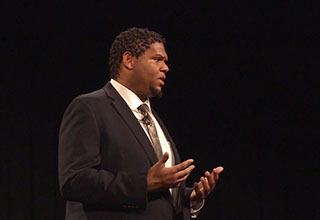 Sir Aaron Mason received his master’s degree in marriage and family therapy from University of Wisconsin-Stout and is currently a doctoral student in the marriage and family therapy program at University of Louisiana at Monroe. He is an American Association of Marriage and Family Therapy Minority Fellow, therapist-in-training and radio DJ. Sir Aaron currently works at The Wellspring Alliance in Monroe, Louisiana with families who have experienced domestic violence. Learn more at www.siraaronmason.com. Joe Schmit is an author, award-winning broadcaster, community leader and popular keynote speaker. His book “Silent Impact: Influence Through Purpose, Persistence and Passion" is now in its third printing. He joined KSTP-TV in 1985 and has won 16 Emmys from the National Television Academy. He was also honored with a National Headliner Award in 2001. Joe is also a regular on 1500ESPN radio. Learn more at www.joeschmit.com. 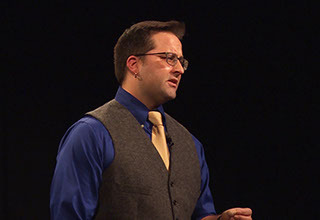 “EDGE” was the theme selected for TEDxUW-Stout 2015. 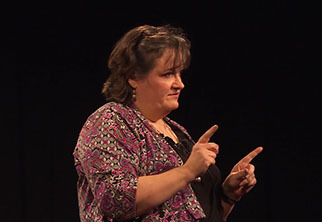 Each presenter offered opportunity to the on-site audience to “Explore”, “Discover”, “Grow” and “Engage”. Now you have that opportunity. In these videos you will find an assortment of inspiring personal stories, tales of epic adventures, humor for home and workplace, heroic efforts to change human behavior, kindness and compassion, ‘edgy’ technology and science. Now is your time to find your TEDxUW-Stout EDGE. Enjoy! A group of enthusiastic and dedicated volunteers from the campus and community review every abstract submitted. Members of this group reviewed the invited videos and made final selections from there. Why is EDGE the theme of this TEDx event? EDGE is the acronym used to encourage student involvement. Explore, Discover, Grow, and Engage describe paths students take to bridge the learning gained in the classroom to learning gained outside of the classroom. Ideas worth sharing are often generated when a connection is made between the in- and out-of-class experience. We think this theme generalizes well to this TEDx independently organized event. Do tax dollars support TEDxUW-Stout? No, tax dollars do not support TEDxUW-Stout. Funding for this event is from sponsorship donations and in small part from student fees. Why is it called UW-Stout and not UW-Menomonie? James Huff Stout was the son of a local lumber baron. He had an idea worth sharing, and built a world-class manual training school with programs in manual training and domestic science training. He also introduced a kindergarten teacher training school and a school of physical culture. Stout went on to become a state senator and life-long proponent of progressive education. The Stout Manual Training School is now known as the University of Wisconsin-Stout, Wisconsin’s only polytechnic university. Any other questions can be directed to the event email.